Cat’s love to nestle into the softest cushions, carpets and rugs and of course your best jacket lying on a chair is just perfect for them. So often they leave more than just the dent in the cushion and those cat hairs then tend to get picked up by our clothes. Don’t you find you are forever picking them off yourself and your furniture? The Car PET works like magic on all types of Cat Hair – long or short, soft or hard – even on those needle like cat hairs that can get embedded in your carpets and soft furnishings that sometimes even the vacuum won’t remove. It’s great to carry with your house cleaning kit to gather them up every time you clean and perfect for that quick once over just before the guests arrive. We reckon it’s the best ever Cat Hair Remover – and not just by a whisker! If you find cat hairs on your clothes it is best to place them flat on a table, hold them securely with one hand and brush The Car PET Pet Hair Remover towards you with light pressure to easily and effectively gather up the cat hair. It will then easily ball up in your hand for you to chuck in the bin. 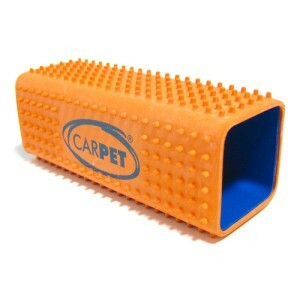 When the CarPET was developed they never even thought it would become a Horse Hair Remover too. But soon word began to trickle back that the CarPET was incredible on horse rugs and numnah. It is really effective at getting both the long and regular horse hair out of wool or fleece and because it’s so robust, you can keep it with your tack wherever you are so it’s always available at shows or events. And because they are so economical you can keep one at home too as part of your regular cleaning program.